I was reading this article from Lisa Earle McLeod, and it made me really think about goal setting and happiness. Here is an excerpt. Notice the difference, her real goal is to immerse herself in beauty. Paris is a good place to do that, but she can also experience beauty in her daily life by noticing and bringing beauty into her office, home and hobbies. What are my goals and how do they translate into experiencing them daily? Here’s a few of them. I want to write things that matter and have impact. Why? I want t feel significant. I want the products I create to help others succeed. Why? I want to feel useful. I want to go to go to places like San Diego Comic Con Why? I want to feel a part, connected, play more. I want my kids to be my best friends (some day). Why? I want to the power of family to remain important. How can I incorporate it (significance, usefulness, community, and family) into my daily life? 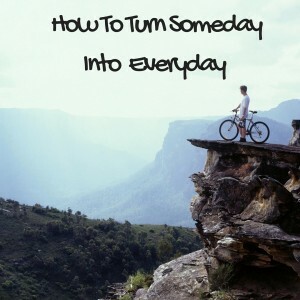 Everyday vs someday makes it to where we don’t have to wait on having enough money, time, or energy to reach a human need we want to, need to, feel right now. What do you want to experience from those goals? How can you experience what you want, in small ways, daily, where you aren’t dreaming about some day so much?